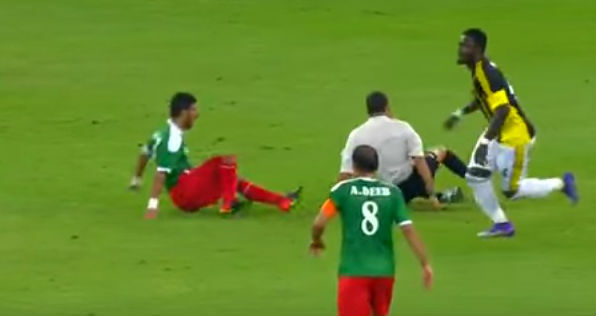 Former Portsmouth midfielder wipes out two men at once during Al Ittihad v Al Wihdat. Watch the moment former AC Milan, Inter and Portsmouth midfielder Sulley Muntari pushes an opposition player into the referee during an Asian Champions League match between Al Ittihad and Al Wihdat. Al Wihdat’s Ahmad Hisham is the player on the receiving end of the Ghana international’s shove on the official.